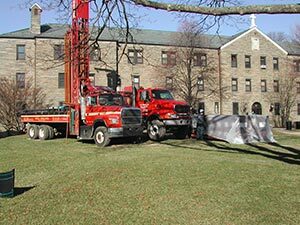 Villanova University, as part of their "green" campus initiative, upgraded one of their dormitory buildings, Fedigan Hall, supplementing the heating and cooling system with geothermal standing column wells. 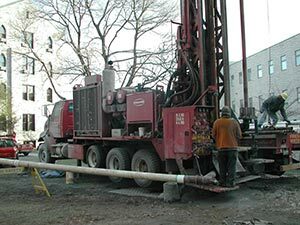 To properly design the geothermal system, ARB Geowell Systems of Conshohocken, PA, performed thermal measurements on an 800' deep well, with the drilling conducted by K.L.Madron Well Drilling and Pump Installer. 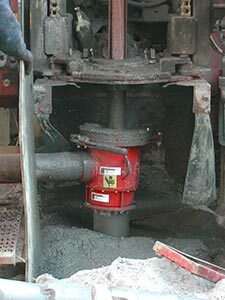 The drilling contract, string installation, thermal and hydrogeological study were all completed during the window provided by the student winter break from Dec 29, 2008 to Jan 10, 2009. 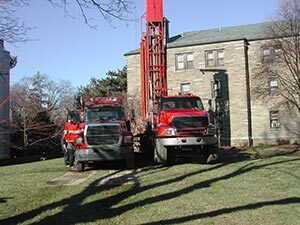 The conclusions reached by ARB Geowell Systems supported a geothermal design utilizing optimal well depths, resulting in significant capital savings for Villanova. 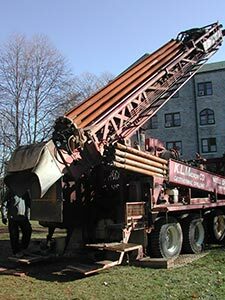 The University seeks to apply similar geothermal installations to other buildings on campus, and to quantify the benefits. Some pictures from this site work at Villanova University are shown.